During 2017 bitcoin rose from $900 to $20,000. As I write this, it was priced around $16,000. According to Warren Buffett, in Forbes in November 2017, “You can’t value bitcoin because it’s not a value-producing asset… it’s a real bubble… It doesn’t make sense…I don’t believe in this whole thing at all. I think it’s going to implode.” Jared Dillian of Mauldin Economics expects bitcoin to eventually be priced around $150. It is newsworthy how many investors and analysts have recently asserted that bitcoin – and by extension, all cryptocurrencies – are in a bubble. This in a day where the Dow is up to almost 26,000 and all indexes are at all-time highs. A few analysts are saying the stock market is in a bubble. Yet Robert J. Shiller, Vanguard Founder Jack Bogle, James Rickards, Peter Schiff, Ray Dalio, CEO of JP Morgan Jamie Dimon, Nobel Laureate Joseph Stieglitz, and others have all stated in the past year that bitcoin is a “fraud,” “it ought to be outlawed,” or it is in a bubble. This was all before bitcoin hit its recent all time high of almost $20,000. Since then, it corrected to almost $11,000, or down about 40%, bitcoin’s largest correction since 2013. But then it rebounded into the $15,000 range, then corrected again. Some investors – Schiff in particular – make some salient points about bitcoin and bubbles. Therefore, it is worth examining the nature of bubbles, and the arguments that cryptocurrencies are in a bubble, to determine whether the space is still worthy of investment. Analytic capabilities appear to fail when it comes to crypto. So many assert the bitcoin bubble you would think the contrary position would be gaining advocates. 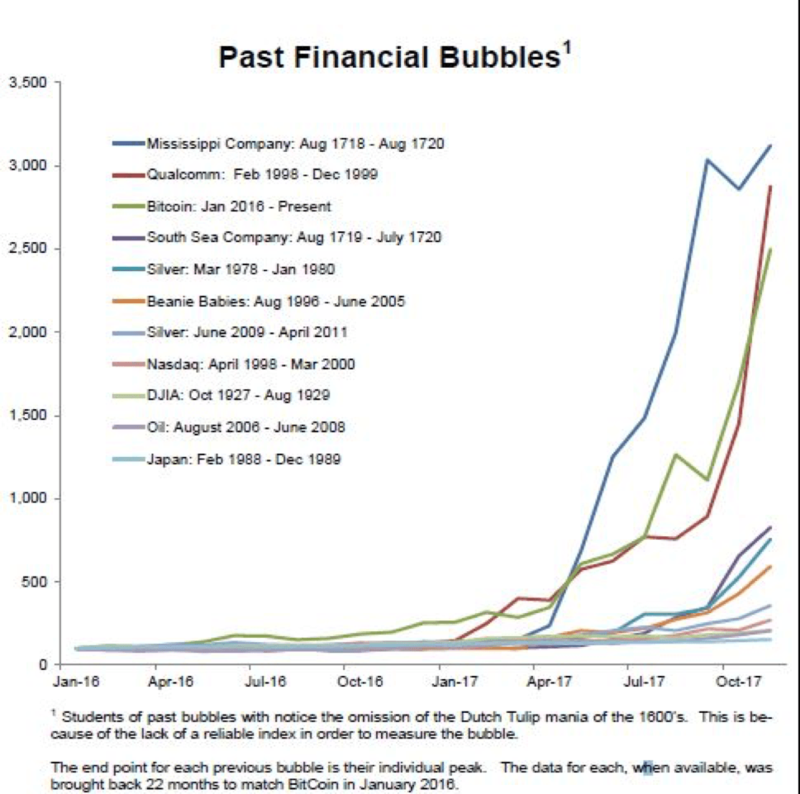 According to Birinyi Associates, bitcoin is already one of the biggest bubbles of all time, larger than the NASDAQ bubble of the 1990’s (see chart above). But again, none of these analysts or articles explain why bitcoin is a bubble; they only assert that it has bubble qualities, by which they mostly mean that it has experienced a sustained parabolic rise. Is a parabolic rise a necessary and sufficient condition to label a phenomenon a bubble? Necessary, perhaps, sufficient no. More to the point is John Authers’ view in Bitcoin Bubble Follows Classic Pattern Of Investment Mania that the value for bitcoin cannot be shown. The crux of the issue is that analysts see bitcoin and cry ‘bubble’ because they don’t understand either term. Is bitcoin a stock? Is it a commodity? Is it a currency? Where is the value, and how should it be determined?